It is likely that all beer, wine and spirits labels will change dramatically in the near future. TTB Administrator John Manfreda confirmed this in a recent speech. TTB has been working on new rules since CSPI and other groups submitted a petition in 2003. The new rules would require a “Serving Facts” panel on every container. This panel would include a lot more information, such as the typical serving size, number of servings per container, calories, carbohydrates, protein and fat. Because this is a big, controversial change, TTB has received more than 18,000 public comments during the past few years. There are far too many comments for most people to review, and so we will highlight and summarize the most noteworthy comments here. The most recent proposal and comments are here. This is comment 21 in a series; to see others, click on the “serving facts” tag below. 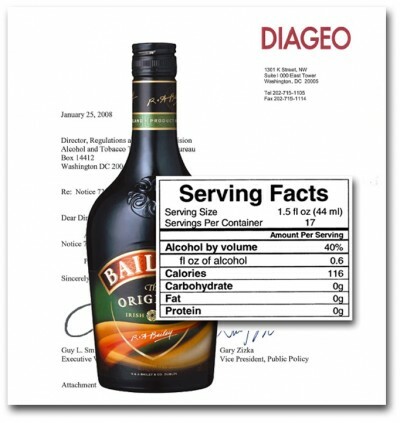 Diageo hired Mr. Taylor in 2005 and he’s currently a research professor at George Washington University. From 1991-1994 he was FDA’s Deputy Commissioner for Policy and was actively involved in setting the comparable rules for foods more generally. The Dietary Guidelines are an important tool and among other things they point out that moderate consumption of alcohol may convey health benefits. It is wrong to argue that there is no “standard drink.” The concept can and should be used to avoid the need for consumers to make complex calculations at the point of purchase. It is similar to the % daily value concept successfully deployed by FDA. “Any new alcohol label will have to be explained to consumers, and TTB should recognize that no new information tool on a consumer label achieves its full utility overnight or automatically.” TTB must preserve the “serving facts” concept and make it workable. I read the TTB commentary on this and they are missing the point on small brewers: Batch to batch variation is easily over the tolerances TTB expects both because of physical plant temperature changes over the course of the year and year to year ingredient variations (not to mention sourcing variations) The upshot is that although the cost to produce any given label isn’t that bad (and extra $250 and minimum about $500 to print), if they have to be produced for EACH batch of beer that comes out, this would add probably 8 weeks lead time to bottling (can’t get anything started until the batch is out of fermentation) and $750. Our batch size is about 100 cases so this is an added direct cost of $7.50 per case. That is assuming that we can even get that much stuff on a label and still say what it is. What is TTB doing to deal with this sort of issue? From IRS to ATF to TTB to What?